The refrain to the anthem of the unrecognized Donetsk People’s Republic says that “there is nowhere to retreat and this has happened more than once.” If there is a better line to describe Russian President Vladimir Putin’s diplomatic and military game in Syria, this author is all ears. Since Russian fighter-bombers, special forces and marines intervened in late September to support Hezbollah, Iranian regulars and the Syrian army on behalf of the Assad regime, the ultimate goal was a bargain with the West (namely U.S. President Obama and German Chancellor Merkel) on the future of Ukraine. Assad and Tartus were never strong enough draws for Putin to align himself with a Shia coalition, risk blowback from Sunni Islamists and possibly see Russia dragged into another Afghanistan. As late as last Tuesday, Dmitri Peskov, Putin’s press secretary, discounted any Russian ground operation in Syria against ISIS or any member of the “terrorist” coalition confronting the Assad government. In other words, someone else (other than the U.S. and its erstwhile NATO allies) has to do the dying and seizing of territory to direct Syria’s course. That someone would be the Shia coalition protected and directed from Moscow with Russia controlling the pace and terms of Assad’s departure, Syria’s political transition, Russia’s assets in the Mediterranean and whatever else it can extract before the fighting ceases. Western leaders and media analysts typically end the analysis here. With few exceptions, the consensus still apparently runs that Putin’s intervention in Syria is an end in itself aimed primarily at humiliating the U.S. and NATO, protecting an ally without whom Russia’s regional influence would fade and building a Shia coalition to threaten the Gulf Arab states. Putin’s actions up until the Paris terror attacks of November 13th provide little evidence for this paradigm and many independent Russian analysts have discounted it. Putin has no blood brother devotion to Assad — his private meeting with him in Moscow on October 20th was taken by Kremlin watchers to include discussion of the Syrian leader’s departure. The Deputy Speaker of the Duma Foreign Affairs Committee, Leonid Kalashnikov, said that “Assad very likely demanded an increase in military aid and Putin, for his part, requested that Assad be more careful regarding his ground operations going forward.” Kalashnikov does not believe that Putin urged Assad to leave in the near term, but raised the prospect of his resignation should eventual circumstances call for it. Others believe that Putin meant to signal to the U.S., Turkey, the Sunni opposition and Assad’s Gulf rivals that the Syrian President would be party to any negotiations regarding Syria’s political transition even if he would not remain its leader at the end of the process. Whatever the truth, there is no question that Putin has been less than unequivocal regarding Assad. He has held separate meetings with Iranian President Rouhani and Turkish President Erdogan to discuss Assad’s fate and, a statement with Rouhani that outside actors will not impose political conditions on Syria notwithstanding, gave no ironclad support for keeping Assad permanently in place. Russia does not need Assad to achieve its limited objectives in Syria and a long-term partnership with Iran and its proxies carries unique risks (not least as regards Russia’s restive Sunni Muslim population). More importantly, aside from the humiliation of the West, gains Putin little in a Russian economy plagued by capital flight, a high perception of investment risk, endemic corruption, $46 a barrel oil prices and targeted sanctions. Whatever temporary public relations boost the Kremlin might achieve is outweighed by these fundamentals. That Russian equities traded higher over the past month while oil prices held flat should surprise no one. Since launching his diplomatic offensive at the United Nations two months ago, Putin has done his best to bring himself out from the cold and make Russia an indispensable nation again. The logic, of course, is that indispensable nations willing and able to do the work that other nations can (but won’t) do should not be sanctioned or diplomatically isolated. The United States and Britain did not sanction Stalin’s Soviet Union when the three joined in an “anti-Hitler” coalition against Nazi Germany. Neither should the U.S. and European Union sanction Russia if it joins in a struggle against Islamist terrorism (emphasis on ISIS or whoever happens to be designated an Islamist terrorist group by the Kremlin). Syria was supposed to make the West forget about Ukraine, allow Putin to save face in front of his public following the fulfillment of the Minsk Agreement (and consequent liquidation of the separatist republics), end most or all sanctions imposed after the annexation of Crimea and quietly bury further inquiry into who exactly brought down the Malaysian Boeing passenger plane over rebel-controlled areas of eastern Ukraine. Until the Paris terror attacks of November 13th, the West, led by the U.S., stuck to its refusal to link the two conflicts — sanctions and support for Ukraine’s territorial integrity would remain, Putin’s military intervention in Syria would be chastised to the extent it deviated from operations against ISIS-controlled areas and Assad would have no role in any political transition. On October 31st, 224 people died after a Russian passenger plane exploded over the Sinai en route to St. Petersburg. Although British and American experts were convinced within a few days of the crash that it was caused by an explosive, and ISIS swiftly took credit, Russia steadfastly refused to confirm a terror connection. Russian analysts believe that this reticence stemmed from Putin’s genuine concern about how such a mass casualty event would play with a skeptical Russian public. Kremlin-regulated media had painted a picture of the Syrian campaign as short and bloodless — hundreds of civilians murdered in a matter of minutes as direct retaliation for the Kremlin’s unilateral adventurism could prove a public relations nightmare. There is a popular meme among Russian analysts that Putin fades, disappears or delays his response to unexpected crises. This occurred in the immediate aftermath of the Kursk submarine sinking as well as the seizures of the Nord-Ost theater and the Beslan school. Yet on November 13th, before the scale of the carnage in Paris was fully known and prior to French President Hollande’s televised address to the French nation, Putin, through his press secretary, expressed unequivocal condemnation of the terrorist attacks and showed an unusual level of assuredness in the assistance Russia was prepared to provide the French government. Why did Putin wait almost two weeks to confirm what everyone knew a few days into the Sinai disaster investigation and what explains his uncharacteristic discipline in the immediate aftermath of the Paris massacre? Respected Russian political analyst Stanislav Belkovsky gave a stunning answer — Putin knew of the Paris attacks in advance and likely refused to share vital intelligence with the French in order to let them happen. The prior knowledge came from Russia’s extensive intelligence assets within ISIS’ command and control structure via a decades’ long relationship with high-level military and intelligence personnel from Saddam Hussein’s Ba’athist regime. Following the overthrow of Hussein, the rise and fall of Al-Qaeda in Iraq and the emergence of ISIS fueled by the disaffection of Iraq’s Sunnis with the Shia-centric government in Baghdad, many of the top commanders of ISIS (including people involved in planning its overseas terror operations) were drawn from Hussein’s loyalists. Yevgeny Primakov, former Foreign Minister, Prime Minister under Russian President Boris Yeltsin and Soviet intelligence veteran, oversaw the Soviet (and then Russian) Iraq files for decades. He knew the important players in Iraq’s intelligence and defense establishments and maintained a personal relationship with Saddam Hussein since the mid-1960s. Primakov made support for Hussein’s regime an anchor of Russian foreign policy after becoming deputy director of the KGB in late 1991. Cooperation between Iraqi and Russian intelligence dramatically increased, Primakov leveraged Russia’s position at the UN to work with Iraq in circumventing international weapons sanctions and Iraq’s chief of intelligence paid a personal visit to Primakov in September 1993 to warn him about alleged dissident Iraqi financing of the Kremlin’s opponents in the Russian Duma. Aside from Russian sources, an excellent overview of Primakov’s links to Iraq was published by Australia’s National Observer. In short, the relationship between Hussein, Primakov and their respective offices could not have been more intimate. Primakov may have been the last foreign dignitary to hold a private meeting with Hussein before the Second Iraq War — on March 17th (two days before the U.S.-led invasion) — where he urged the Iraqi dictator to resign and save Iraq from an “impending catastrophe.” Hussein declined. In between orienting Russian foreign policy against the U.S. and toward Iraq as a counterweight to NATO’s influence in the Middle East, Primakov met and grew close with Putin when the latter became head of the Russian FSB and then Prime Minister under Yeltsin. Primakov was a key member of anti-liberal bloc in the Kremlin drawn from former Soviet KGB and military officials instrumental in facilitating Putin’s appointment as Prime Minister and Yeltsin’s successor. Although Putin and Primakov were on opposite sides in the run-up to Russia’s Presidential Elections in 2000, the former kept the latter on in his government, consulted him on matters of importance and retained his neo-Soviet approach to foreign policy. Primakov’s central role in the “strongman” Kremlin bloc from which Putin originated have led some to dub him “Putin’s Political Godfather.” In any case, in his positions at the FSB, as Prime Minister and then as President, Putin took over the Iraq portfolio carefully maintained by Primakov and kept those assets in place after the fall of Hussein. We may never find a smoking gun document to prove when Putin knew about the Paris attacks or how much precise operational information Russian intelligence received, but the history and circumstantial evidence available make Belkovsky’s argument more than plausible. Putin could now link the Sinai plane crash to the Paris attacks, turn a potential public relations disaster into a call for international unity and use the hapless Hollande as a conduit to secure the grand anti-ISIS coalition which he had been denied for over a month. Now Russia and France, suffering mass casualties at the hands of ISIS, would take the fight to the Islamists and whoever else might get in the way. If the U.S. stays on the sidelines and does not change its tone, so Putin’s thinking went, it would be maligned for abandoning its oldest ally in its hour of need. It is worth noting that the relative strengths of the Russian and French air forces mean that, for all the bombast, Hollande cannot project the power needed to defeat ISIS on his own. Despite the favorable turn of events, Putin’s problem remained American insistence against linking Syria and Ukraine — something Obama underscored to Hollande prior to their meeting in Washington for fear that the latter may be open to letting at least some sanctions expire in exchange for Russian cooperation against ISIS. For his part, Putin, who previously had mostly struck Assad’s opposition while claiming to bomb ISIS, launched 75 sorties over the terror group’s Raqqa stronghold and nearly flattened it. But without ground troops, many analysts believe a conclusive defeat of ISIS will be out of reach. Putin will have to drown the Islamists in Russian blood to receive significant concessions on Ukraine from NATO and that, his critics believe, may be a bridge too far. Should the Kremlin commit to a ground operation, some Russian analysts think the size of the force may number no more than 30,000 men which may not be sufficient to conclusively defeat ISIS’ 60,000 fighters (by liberal estimates). For all of his foresightedness, Putin conspicuously failed to anticipate how Turkey’s Erdogan could act to spoil his plans. Whereas Putin’s goals in Syria are limited and indirect, Erdogan has treated regime change in Damascus as a matter bordering on the personal. Turkey’s three overriding objectives in the Syrian Civil War are to: 1) remove Assad and replace him with a Sunni Muslim unity government (preferably influenced by or friendly with the Muslim Brotherhood), 2) protect Syria’s Sunni Muslims in order to outmaneuver the Gulf Arab states on the Sunni Arab street and 3) prevent the Kurds from gaining autonomy or, worse, independence in northern Syria as part of a potential Kurdistan with their brethren in Iraq. 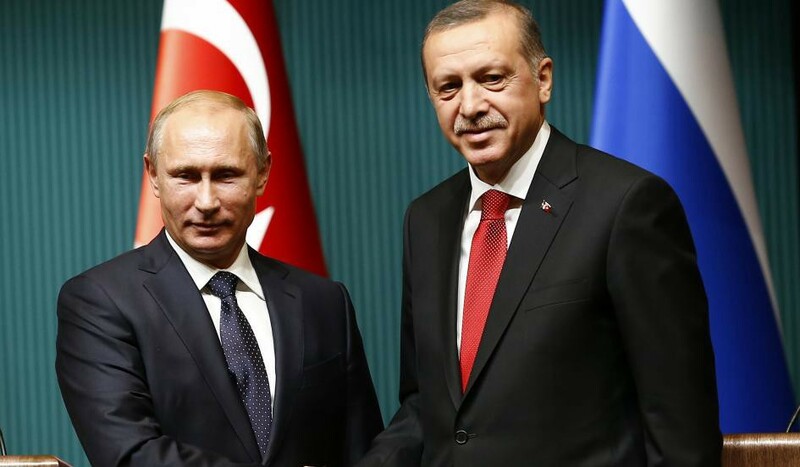 To achieve these ends, Erdogan has shown less interest in fighting ISIS than even Putin. Erdogan’s regime was an early seed funder of the extremist group, clandestinely purchased oil from ISIS-controlled territory and routinely looked the other way as ISIS fighters crisscrossed between Turkey, northern Syria and Iraq (including foreign fighters moving through Turkish territory to join the jihadists). Worst of all, perhaps, has been Erdogan’s cynical use of a war against terrorism (with language straight from the Kremlin’s lexicon) to neutralize Kurdish guerrillas (ISIS’ toughest opponents) along Turkey’s border and pave the way for a political comeback after his AKP party lost its dominant parliamentary majority earlier in the year. Just as Putin launched most of his sorties against Assad’s “moderate” opponents while pretending to attack ISIS, so has Erdogan targeted the PKK and other Kurdish forces while telling the U.S. and its allies that it was hitting ISIS. Obama, for his part, went along with Erdogan’s scheme and quietly sold out the Kurds so that U.S. aircraft could make use of Turkish bases. In short, Erdogan’s approach to the Syrian conflict has been to protect the Turkmen of the anti-Assad opposition affiliated with the Islamist al-Nusra front, bludgeon the Kurds at home and in northern Syria and do as little as possible to actually defeat ISIS. Erdogan has made Kurdish seizure of northern Syria and control of its border with Turkey a red line which his government will not permit under any circumstances. He has also repeatedly urged a no-fly zone to be imposed in the area ostensibly to create a buffer zone for Syrian refugees against ISIS. The actual aim, it would appear, is to prevent Russian air support for the Assad coalition’s operations against Turkey’s Sunni allies. When a Russian Su-24 was intercepted and shot down by a Turkish F-16 for violating Turkish airspace (in an area measuring approximately 2,000 meters which a Su-24 can cover in less than six seconds) on November 24th, aspersions were cast on whether this was an act of recklessness. Russian aircraft skirted Turkish airspace at least twice in October and are obliged to land at their base in Latakia from the north due to high winds. That Turkey looked the other way for a month and acted now, despite the brevity of Russia’s incursion, weighs toward premeditation and an order from the upper echelon of Turkey’s political leadership. Having failed to secure a no-fly zone for his allies before the G-20, and with NATO cool on the idea after the Paris attacks, Erdogan may have decided to take matters into his own hands and force events. Whatever the resolution of the instant crisis, Erdogan’s unilateral power play in Syria and collision with Russia will reverberate not just in the Middle East but in Ukraine whose future depends on the success of Putin’s Syrian gambit.